My packaging loving heart has been craving to make some pretty stuff. I was hoping to have this post ready well before Mother's Day but as good plans always go...I am posting it now. I have been working for a few weeks on my craft studio/homeschool room. Cleaning and organizing has helped me find supplies that were crammed in the bottom of baskets and other nooks and crannies. It made it fun to take a crafty break and make some of these. I used unfinished wood tags and bobby pins with other little paper scraps and random craft bits to make sweet little clips and tags. I especially love glassine and paper bags for gifts and thought these bobby pins would make such cute and different ways to wrap them. Tiny buttons, crochet flowers and a pom pom glued to the end of each painted bobby pin make easy and pretty bag clips. A little crochet flower with some distressed and painted bobby pins make a simple bag clip. Wrap with some fun twine and you have a simple little bag closure. Decoupage paper to the wood tags to pretty them up and glue a clothespin to it to hold your message. It makes them reusable and adds a unique touch to a gift. Use washi tape to add a cute flag or attach a note. Glue a binder clip to one and make a mini clipboard! So many ideas for simple little tags! 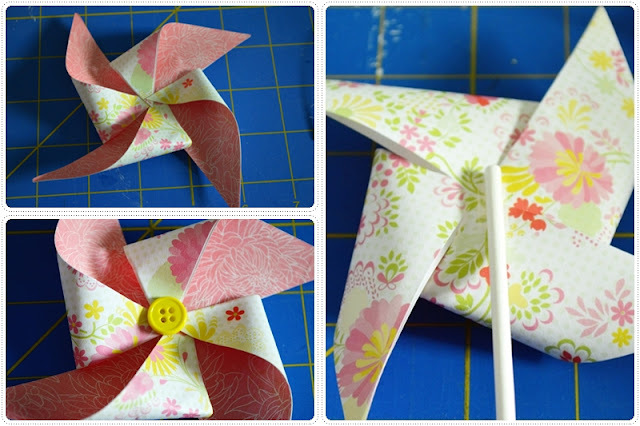 Attach a clothespin to the back to clip to a gift or bag too! You can make them like little dry erase boards by laminating them or covering them with packaging tape before gluing them to the wooden tag. You could do this with regular paper but I like that the wood keeps them from getting bent and will last longer. Write a message with a dry erase pen and you have a reusable tag to pass along! I love playing with pretty packaging. Enjoy the ideas and hope to see you again soon! 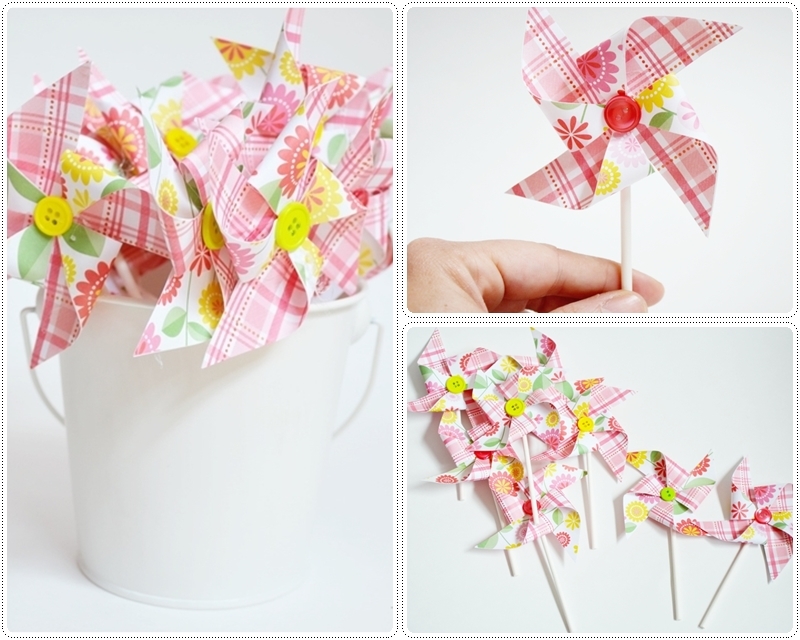 I wanted to peek in with a quick and easy tutorial to make easy pinwheel picks. Yesterday I made these and the cupcakes because we celebrated Cati's birthday at school today. Her birthday is not until the end of the summer but they celebrate all the summer birthdays during the last few weeks of school. Which is rather confusing for Cati. :) She keeps asking, "Am I six now?" But hey...she got some yummy cupcakes out of it. 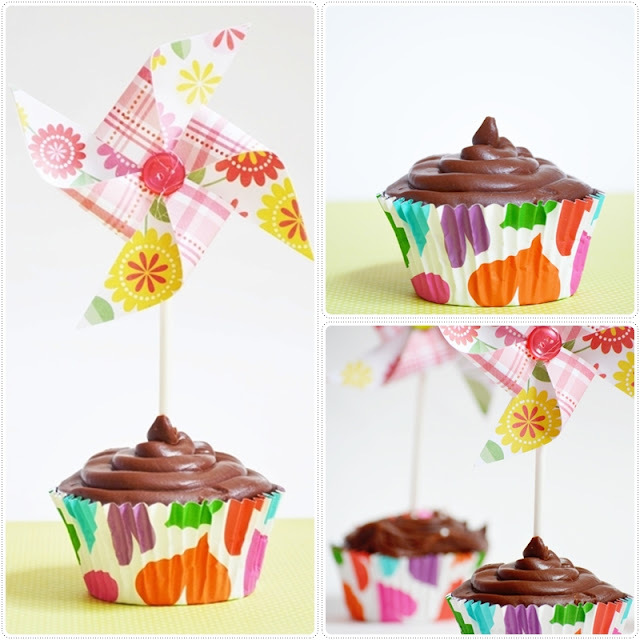 I honestly think these are more versatile then just popping them into a cupcake. Embellish a package or bag, a garland or wreath, or pop a big one into a goody bag. It just proves us bloggers are real people with real lives. And some of us...maybe, kinda, might be...legally blind and failed to catch this until photo editing. So there. You now know I am legally blind even behind a lens. Cut two 3x3 inch squares from 2 pieces of paper. Double sided paper would be easier! 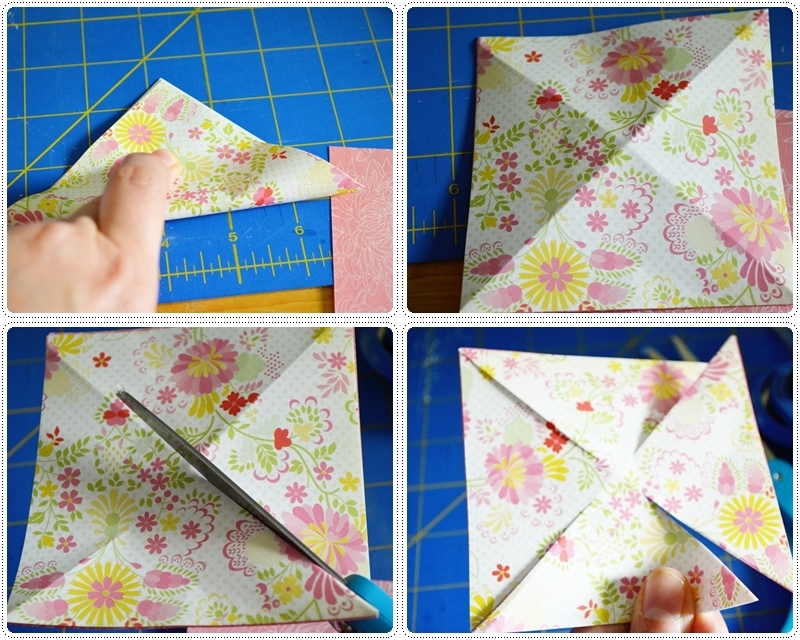 Using double sided tape, tape wrong sides of paper squares together to create a two sided square. 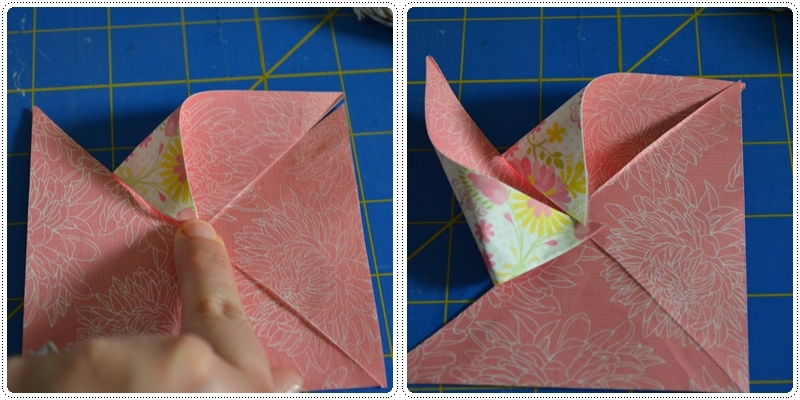 Fold one corner to the opposite corner on both sides creating a crease shaped like an "X." Cut on the folds until you almost get to the middle leaving about 1/2 inch. Fold the left point down with the point towards the middle. If you start with the left like I did, pull the left side of the other three triangles too. Secure them with hot glue in the center. Embellish the middle with a button or bead and hot glue a lollipop stick or skewer to the back. As many of you know, I have a very tender heart for so many women on Mother's Day. I wish many of you a happy one as you cherish those precious blessings in your life. My own day started so sweet as I opened hand picked gifts from both my girls. They each got me gum, picked out precious cards and wrote in their endearingly sweet handwriting of a child. They drew me beautiful pictures that I look at with a heart that swells with a love I did not know possible. My oldest picked out a hot pink cell phone case for me knowing mine was broken. And my youngest got me a hot pink set of tools. I know I will be a smiling fool whacking at some nails with that delicious pink hammer some day soon. Those girls are so precious. They even picked out flip flops for me. Ella chose green (her favorite color) and Cati chose pink (her favorite color). When I got dressed for the day, I could not choose which ones to wear. Who knew what a mother's heart will do for her precious babies? People looked at my feet and then at me like I was a complete nut but so be it. I am nuts...about my girls! But my heart typically focuses on many women whose pain was great today. For many years, this day brought me pain as I ached for a baby. As I prayed year after year to be called that beautiful name that would belong only to me from my own precious child...Mommy. This day was one where I would wish the hours away, avert my eyes from the the bouquets of flowers being bought or received, or sadly witness happy families with the mother (yet again) bursting with child as they ushered their other children here and there. Sitting with pain and an odd sense of shame as mother's were asked to stand in church to be honored for their so coveted role and title. It was typically a dark day year after year. So today is the day I stand up for women who I share a bond with for always. Where this day brings pain, grief, and maybe even anger. Because I have walked in your pain. And carry a bit with me now so I will never forget my journey. Or your fragile heart as you courageously work out these emotions in your heart. Women (and men) who have lost their mother in death. Mother's who have lost a child to death or miscarriage. Mother's who are not yet mother's because they are waiting for God to bless them by conceiving yet in their hearts they are a mother already without a baby to hold. Mother's who anxiously wait to adopt and still have not wrapped their arms around their babies and ache for them to be home soon. Mother's who have courageously given their children up for adoption knowing they will have a better life. Mother's who may be estranged from their children or vice versa due to past hurts and mistakes. For you I stand because I have a special place in my heart for you. Today I prayed for you all day. Loving you without knowing your name and seeing your precious face. But knowing you are there. Praying that this day will somehow bring you peace and a knowing of God's perfect love. My daughter's birth mother was on my mind a lot too. Does she miss her? Is her heart full of regret? I know she has other children she has lost too. Sadly, due to poor choices. Does she feel like a childless mother? Does she know that her ultimate, sacrficial decision allowed me to gain that glorious name...that her birth child made ME a mother? Does she know? For her and each and every one of you. With more love in my heart then you may ever even know. And I stand for you this day letting you know that a person you have never met...honored YOU. All righty. Be prepared to swoon. 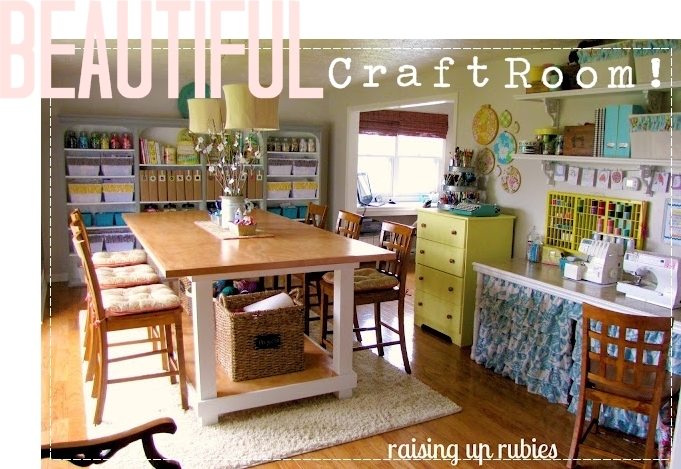 This craft room is seriously my favorite craft room ever. I'm currently working on my own but this one...THIS ONE...(sigh)! I have seen a lot, pinned a lot, loved a lot. But this one is so me, so perfect down to the itty bittiest little detail that I am over the moon smitten with it! Miss Jaime from Raising Up Rubies DIYed this gorgeous room to complete brilliance. And I just love Jaime. She just launched her new blog and she has tons of talent. She was a contributor over at Seven Sisters but decided to go on her own and I am so excited to see what she has up her sleeve. If this craft room is any indication of what she has in store...we will NOT be disappointed. I am already uber inspired by this room! Um, this table was made from scratch. She can have crafty get togethers. For real. I think I'm coveting this table. 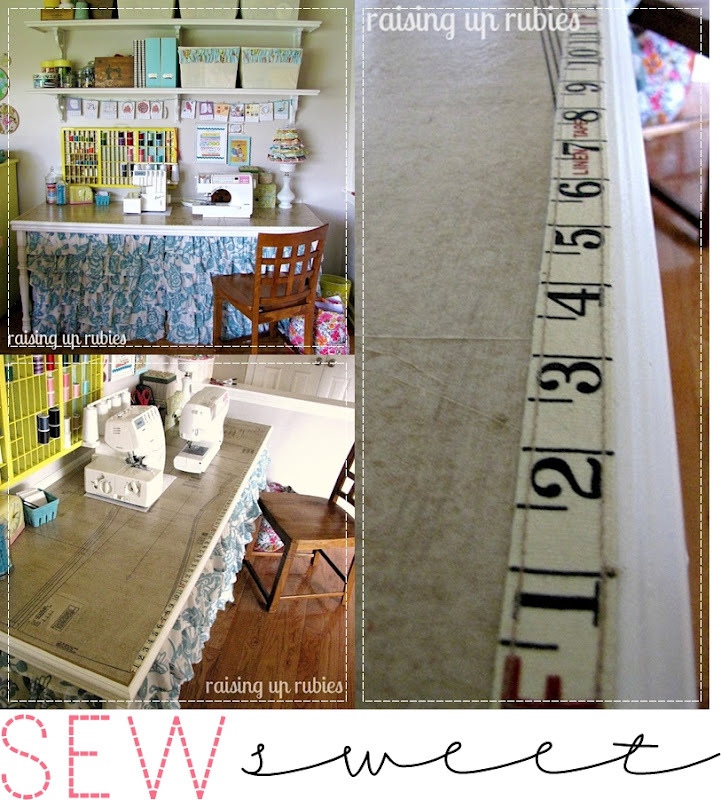 And her sewing area is just amazing. 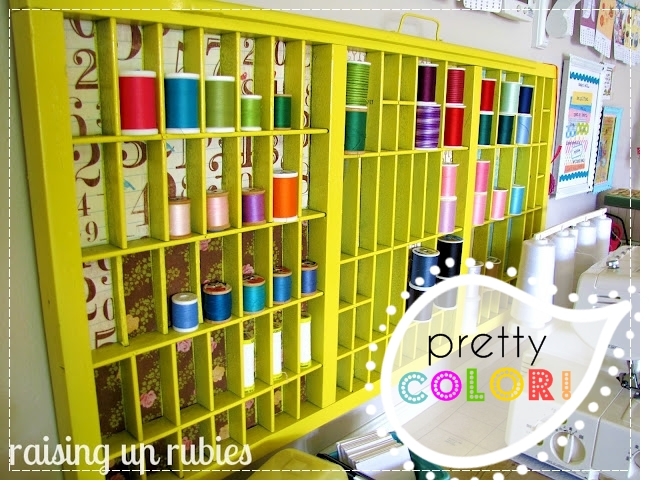 This colorful and pretty thread storage is made from an old typesetting box. The table was decoupaged with a dress pattern and a fabric measuring tape on the edge. All this storage is well thought out and so, so pretty too! 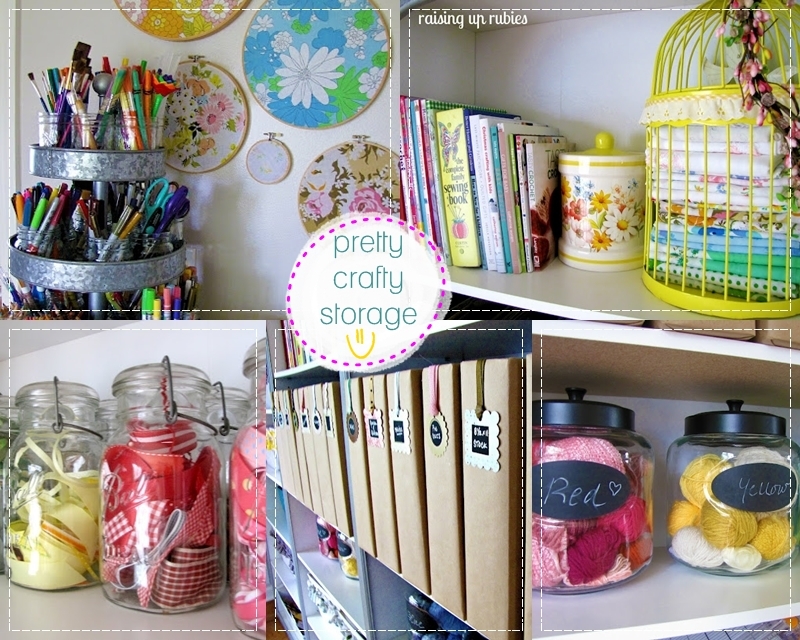 Please check out Jaime's full post on her gorgeous craft room. There is so much more to this room but if I share it all, you won't get to meet the lovely Jaime. 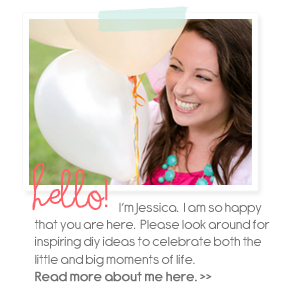 :) Her sweet blog is sure to be an absolute delight and I adore her beautiful style. She has been blessed with so many creative gifts and I am excited to follow her and be inspired time and time again. Thanks Jaime for being incredibly, wonderfully YOU! P.S. 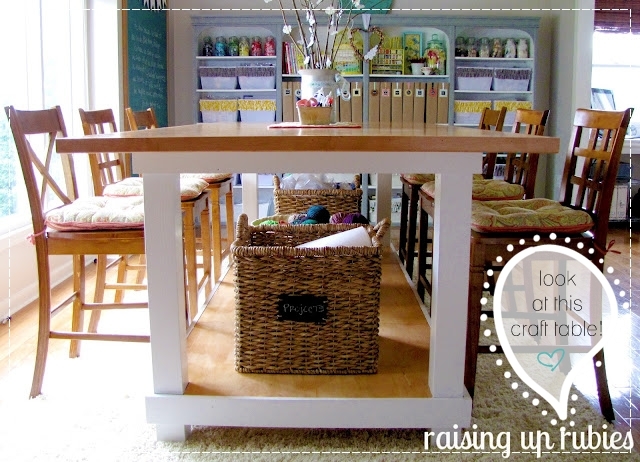 If any of you dear, precious friends would like to pin this craft room, please pin it from Jaime's blog so it will link back to HER. Thanks so much! Oh my word. I seriously wonder why I drag my feet to try new things. It was one of the first apps to be downloaded on my phone. And then it just sat there. Just chillling between the little Joann's app that I use to scan coupons and the ihandy level that I have never used but find incredibly awesome that my phone can be a level. I mean, who knows when you need to hang a gallery wall on the fly? You just don't know. But anyway. Instagram. I love that it can be personal, day to day stuff. I love photos. I love capturing the normal moments that are really precious and easily forgotten. Like eating ice cream, or flowers you just planted. Just awesome. And I know I hardly ever show pictures of me on my blog. Probably because you come here to see crafts and not my goofy face. But I do more me pics on Instagram. My kids. My life. See? It's like a more personal side of a blogger. Pinterest is their tastes and interests, a blog is like a specific niche. Facebook is reconnecting. Twitter is updates and funny stuff said. Instagram is daily life. All your social needs to get to know someone without laying eyes on that person in real life. OK. That made me a little sad. I'm officially inviting you all over for coffee. 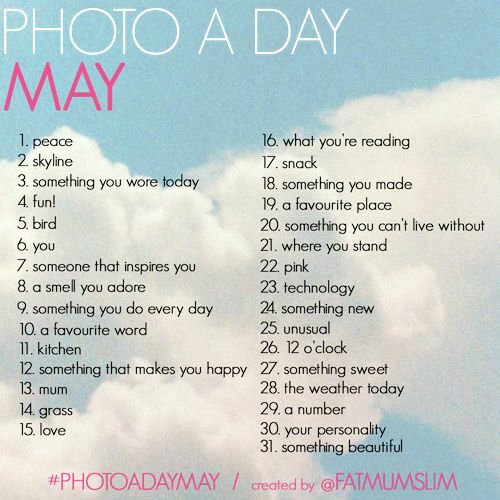 And then there is all the fun with Photo a Day challenges. It is so stinkin' easy and takes like 5 minutes each day. Just snap a pic matching the category, upload to Instagram, use a filter, add a hash tag so others can see your photo, and share it! So fun! I heard about the one below at Fat Mum Slim from wonderfully sweet and funny Kellie from Nest of Posies. I had no idea how fun this is! If any of you are interested, you can find me here on Instagram. Or just search out twoshadesofpink. :) I just got started. I mean...like this WEEK just got started. So if you have any tips for me I am ALL EARS! To challenge myself, I think I'm going to photograph all my favorite craft supplies. Is that weird? I just love looking a pretty photos of beautiful crafty bits. Like who is not drawn in by the beauty of a pile of yarn, a jar of buttons, a stack of washi tape, or a row of bakers twine? Or maybe this is my own weirdness that I have just spewed out all over this blog post to the point of no return. Either way, it will challenge me to photograph things purposefully, easily and of things I love. So let me know if you are on Instagram! I would love to get a peek in on you. It will be such fun!